sure, hacks have a place in the political ecosystem just like everyone else, but I’m pretty happy that lefties tend to be somewhat more wonkish and policy-oriented than righties. So if I’m not endorsing greater liberal hackitude, what do I think liberal commenters should have done on Wednesday night? I’ll tell you, but first let me lay some groundwork. Have you ever heard the old saw that the best way to judge a presidential debate is to watch it with the sound off? Well, I think that’s just about the stupidest piece of folk wisdom I’ve ever heard. It’s not just that this reduces debates to theater criticism. It’s worse than that. It’s not even good theater criticism. After all, would you watch a play or a movie with the sound removed and then write a review for your local newspaper? Of course not. You can’t possibly judge a play without hearing the actual dialog. The same is true for presidential debates. Sure, demeanor matters. If Obama hesitated too much, seemed unsure of what he wanted to say, and inserted too many ums and ers into his sentences, then by all means ding him for it. 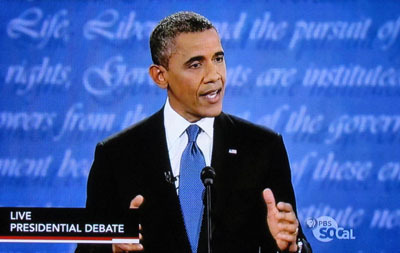 But what I’d really like liberals to focus on is the actual content of the answers Romney and Obama delivered. And on that score it’s hard for me to believe that Obama deserved the shellacking he got. Maybe you think he should have attacked Romney harder. Maybe you think he should have called out Romney’s evasions more crisply. But those are fairly modest criticisms. On a substantive basis, Romney consistently evaded, distorted, and in some cases outright lied. And Obama called him on it. It’s right there in the transcript in case too much steam was blowing out of your ears in real time to hear it. That’s what I wish liberal talking heads had focused on: the actual content of the debate. On that score, yes, Obama could have done better. But it wasn’t an epic disaster. Content, content, content. That’s what I want my fellow lefties to obsess about.